Moire patterns in stacked graphene sheets. High-temperature electricity without resistance could revolutionize electronics. It could take less energy to move electric charge, meaning better-performing, more-efficient electronics that are cheaper to run. It could cut down on energy costs, and might even help researchers realize better quantum computers. Scientists have gotten a step closer with a little “magic” twist. 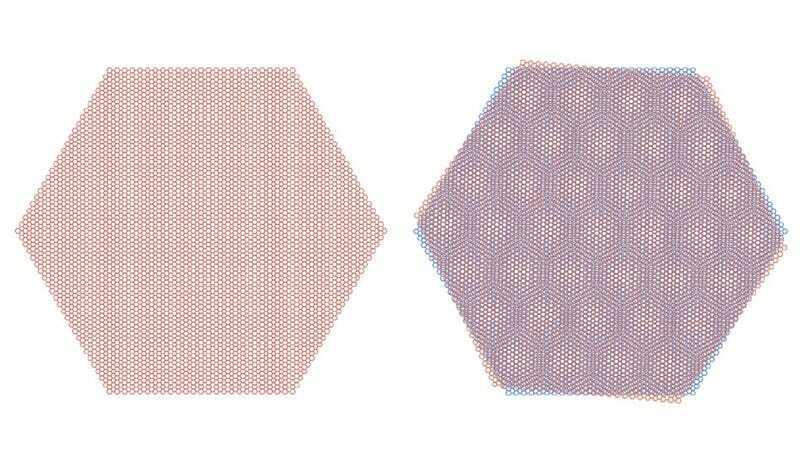 A team of researchers from MIT, Harvard, and the National Institute for Materials Sciences in Japan, have created a whole new kind of superconductor from two sheets of single-atom-thick, two-dimensional carbon, called graphene. Superconductors are systems where electrons can travel unimpeded and without applied voltage. But these new systems seem to operate outside the conventional rules of superconductors and turn on their properties with just a slight twist. This took the researchers by surprise. A small twist, or as the researchers call it, a “magic” angle of around 1.1 degrees, essentially confuses the system into thinking that each unit hexagon is much larger. Check out the first second of the above video to see what I mean. This changes where electrons are most likely to be located. At first, the system looked like a Mott insulator, a system whose inter-particle interactions prevents the electrons from moving. But adding an electric field and a little more charge turned the system into a superconductor. The team published two papers on the discovery this week in Nature. Normally, superconductors are solids that have reached an ultra-cold critical temperature where electrons begin to pair up. These pairs give the electrons new properties that allow them to travel without resistance through the system. But other so-called “unconventional” superconductors, like these stacked sheets, don’t follow these rules. Scientists have been studying non-conventional superconductors for a long time. Many hope to find something that can efficiently move electric charge without wasting lots of energy and money to cool the system all the way to the coldest possible temperatures. 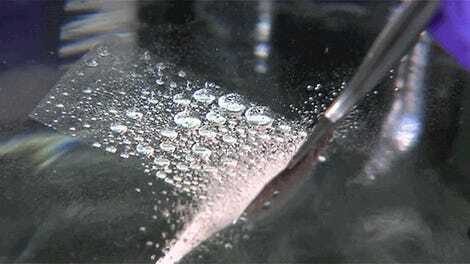 Some have observed high-temperature superconductivity in certain materials that contain oxygen and copper, called “cuprates.” These work at higher, but still very cold, temperatures, around -200 F.
The graphene sheets still required temperatures around 1.7 degrees above absolute zero, -456.6 F, to demonstrate superconductivity. But slightly twisting a 2D sheet is a much easier-to-study system than the variety of cuprates. “To explore this physics, normally you need 100 devices,” said Jarillo-Herrero. “Here, you can do it in one device you can control electrically. That’s what we did that’s most amazing. All of this is in a single device.” And he thinks there’s far more to be done in other systems of slightly-twisted, two-dimensional sheets. Others are pretty excited about this new work. “It really is just showing us that this platform is so rich with new physics and new possible applications that we have to keep going,” physicist Angela Hight Walker from the National Institute of Standards and Technology told Gizmodo. She pointed out that others have looked at the effects of twisting 2D materials before, but this is the first time she’d seen something quite like this, where superconductivity seems to switch on and off with a tiny twist.